ETNHost Review 2019: Is ETNHost a Good Hosting? Since 2011, ETNHost has been providing web hosting services to businesses in Europe. They pride themselves on their green data centers and developer-friendly web hosting platform with multiple layers of protection. ETNHost began offering web hosting in 2011. Over the years, they’ve committed themselves to delivering excellent hosting solutions at competitive prices. ETNHost operates out of four carrier-grade data centers that are located in the Netherlands, Germany, the United States, and the United Kingdom. From the very beginning, ETNHost wanted to create reliable hosting solutions for their customer base. That is why the vendor uses solid state drives and a high-availability, highly secure infrastructure with multiple layers of protection. Multiple layers of security – ETNHost has designed their system with multiple security layers that detect and block threats such as malware, viruses, spam, and network hacking attempts to safeguard the websites they host. Premium network and connectivity – ETNHost has invested in state-of-the-art data centers with advanced redundancy protocols for high performance and availability. Automatic daily backups – ETNHost implements automatic incremental daily backups for all the websites under their purview. The backups can be easily accessed through the control panel, but they’re safely located in a different data center from the one your website is hosted on. Time-tested, 99.9% uptime guarantee – ETNHost is committed to ensuring that the websites of their clients experience minimal downtime. With the help of their Tier 1 network providers, they provide an average of 99.99% network uptime and a 99.9% website uptime guarantee. Sadly, ETNHost does not offer a website builder. However, they do utilize Nginx and Varnish cache optimization, ensuring great website loading speeds for their users. ETNHost’s web hosting packages are definitely competitively priced and within market range. In fact, I’d say that given the long list of features included, their packages are actually better value than most. That said, there are definitely other web hosting vendors with cheaper options. One of the more attractive features that may lead many users to prefer ETNHost is the vendor’s unconditional 30-day money back guarantee. 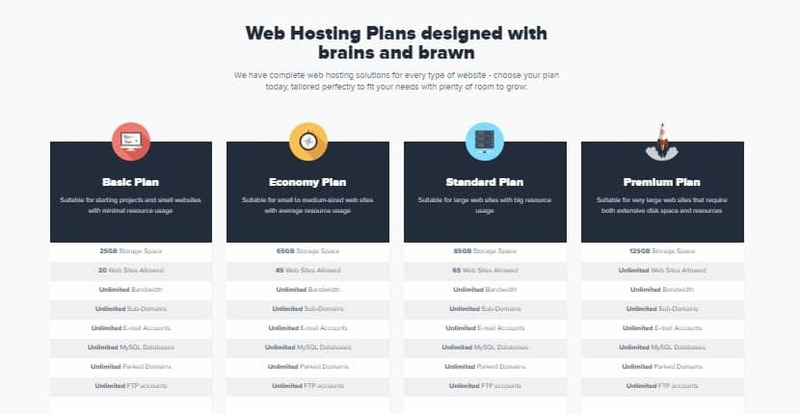 What’s more, this web hosting provider has streamlined and simplified the process of upgrading and downgrading hosting plans, ensuring that as your business grows, your hosting solution can grow with it. The ETNHost support team is another major reason why this vendor is preferred by many in Europe. They’re highly trained and available 24/7, all year round. They’ve got four channels you can reach them through: support tickets, email, live chat, and their call center. The ETNHost ticketing system is pretty straightforward and the live chat works seamlessly. Furthermore, they’ve got a comprehensive knowledge base that’ll be a great help to both beginners and more intermediate users alike. When I contacted their customer support, I was impressed by their short response times. In less than 30 minutes after my initial email, I received a message detailing how I could solve the issues I’d brought up. ETNHost is a notable web hosting vendor in Europe. For users who want feature-rich web hosting plans supported by top-notch technical personnel, I’d highly recommend their services. Wondering how ETNHost stacks up against other Web Hosting companies? Enter any other Web Hosting company and we will give you a side-by-side comparison.